Enjoy this 2 day trip from Tokyo and visit the most popular autumn leaves viewing spots in Niigata Prefecture. October is a perfect time for fall foliage in this area. Experience fantastic rides and aerial views from the longest gondola in Japan, Naeba Dragondola, and the Tashiro and Hakkaisan ropeways. After appreciating the stunning beauty of the autumn colors from the top of the mountain, enjoy breathtaking views of the nature at Lake Shakunage, Yubiso Park and Naramata Dam. Stay overnight at Naeba Prince Hotel with a Japanese & Western buffet dinner. The tour bus leaves Shinjuku at 8:50am starting the four hour journey to Niigata Prefecture. You will arrive at the starting point of the Hakkaisan Ropeway. Ride to the observation deck, which boasts 360-degree panoramic views from an altitude of 3,763 feet (1,147meters) and stretch your legs. The beautiful Mt. Hakkai is popular with visitors and hikers, especially during autumn. After an hour it's time to pop back on the bus where a bento lunch box is provided for you to eat on the bus. When you book, please make a note of your preferred meal option in the Special Requirements box. Choose between a seafood option of sea urchin, crab, and salmon roe, or a pork and maitake mushroom option. With content tummies, you’ll continue to Lake Shakunage to see the autumn scenery and the leaves reflect off the lake. Enjoy a 20 minute photo stop here, before visiting nearby Ikazawa Gorge for more autumnal scenery for 30 minutes. Sightseeing is over for the day and the bus heads to Naeba Prince Hotel where hot springs and an extensive Japanese and western food buffet await. 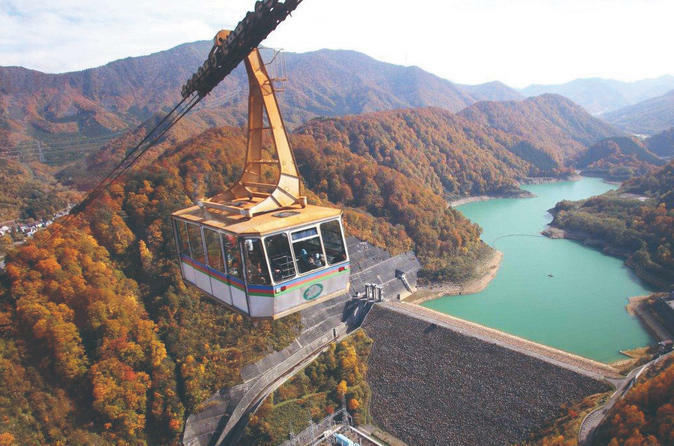 After breakfast at the hotel, you’ll visit Tashiro Ropeway at an altitude of 7,135 feet (2,175 meters). Arrive at the mountain station and you’ll be greeted with sweeping views of the emerald green Lake Tashiro against a mountain backdrop of Mt. Naeba. Walk to the Naeba Dragondola and enjoy a 25-minute through the hills, soaking up views of the autumn leaves all around. A spot of shopping is up next in the ski resort town of Yuzawa for half an hour and then enjoy more fall foliage from your bus window as you pass along the Mikuni mountain pass. Relax over a lunch of matsutake mushrooms in a restaurant in the Mt.Tanigawadake area, then resume your journey to Yubiso Park, a beloved vantage point by the locals to see autumn colors. You'll soon see why as the park faces the Yubiso River with the Tanigawa Mountain Range in the background. Having seen many autumn leaves highlights in Niigata inside 2 days, the bus returns to Tokyo arriving in Shinjuku around 18:40.